After the initial couple of blogletters, you must be wondering why the big gap. In the background I have been working on upgrading from a series of email newsletters to a true blog experience. At the end of this blogletter I cover how to tap into more information on Facebook. My comment: with all our different seedling trees we do come across nuts a bit like this, but it has never been much of a problem, or been so pronounced, though it does seem to affect some varieties more than others. I have told him what I think might be the cause, but it would be very interesting to hear if anyone else has seen anything similar. “The nuts have weak shells, one weak spot on each side, and the birds know here the weak spots are. They are taking a peck at every one.” Last season was much worse that usual. He sprayed the weeds and irrigated for the first time, and it had a bumper crop, and then they all had holes in. He never fertilised it or had nutrient tests. Perhaps we could put our collective minds together and solve his problem? Could it be a shortage of Boron? We had this most interesting email from Jeffrey A Feint. Congratulations on your first “Blog” I guess for the process to work then you need to have input from growers, so hence my letter. On our property we have reached the 3 – 4 tons per harvest which mightn’t sound much but is really quite a lot of nuts when you have to harvest and process them, and it seems that few growers in New Zealand have started to harvest large amounts. Our property is in Wanaka and I find that it is not all that easy to find labour in the region. I have also passed the “70” mark and therefore decided that the way to go was mechanical!….. The rest of this letter, together with a great photo of his machine is on my Facebook page. This inspired me to write to Maurice Denton, who has modified an Italian machine for use on his hazelnuts. And that reply together with a photo is also on the Facebook page. The photo album is called HARVESTING VIRTUAL FIELDAY. 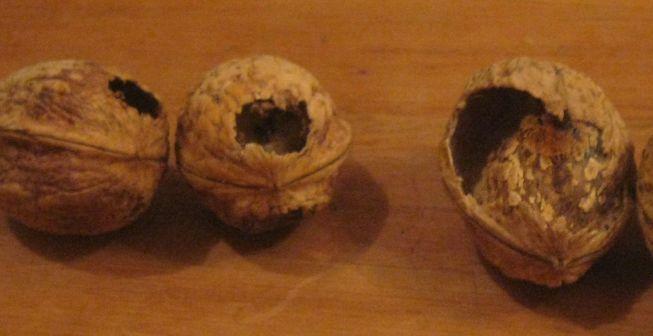 In addition I have added a couple of photos about how we manage our walnut harvest. Then Nick Empson sent me a dramatic photo of what happens when you prune a walnut tree at the wrong time of year. That is the start of the photo album called PRUNING. Now, I am sure many of you have photos of how you prune walnut trees that you can send me with a description of your pruning technique. In my experience, 6 growers around a walnut tree will come up with at least 8 ways of pruning it. I am in the middle of spreading fertilizer. We had a truckload arrive the other day, and I have found over the years that the most important thing about fertilizer is to spread it before the bill arrives! Otherwise it sits in the shed for ever and goes hard. Fertilizer requirements are very individual. Our place is what I would describe as ‘nutrient free’, except that we have almost toxic levels of Potash from the Greywacke rock. So we get a special mix with everything in it except potash. Lime goes on separately in the autumn (1 ton per acre), as our soil is very acid. So acid actually that the rhododendrons in the garden are still happy after being topdressed two years in a row, by a pilot who cannot get into his head we don’t need the stuff on our house roof! Diana Loader wrote about a month ago…. I have been trundling around every walnut tree sitting on the ride-on mower and sprinkling a golden syrup tin full of my fertiliser brew around at canopy circumferences I have done seven hundred. 250 to go. I mixed all this up in the concrete mixer bucket by bucket. Two sacks of ag lime, 1` sack of super phosphate, one sack of nitrophoska blue and half a kilo of Biomin Boron. Some of the older trees got two tins of this brew at a cost of $ 180 dollars per batch. Wal is grizzling at the extravagance but you don’t get nuts off small trees and I am onto my fourth batch. It sounds a slow way to spread manure but it gets it on the right place. Fertilizer spreading had to take back seat this week to goat shooting. Now the neighbour has fixed up his fence, and trapped these animals on our side, there is not much option. He usually collects the bodies for dog tucker, but this time there have been so many that I have been burying them. I am bit wary of putting them too close to walnut trees though, as I have triggered phytophthora in the past by putting carcases right under walnut trees. But it is a pity waste a good dead goat. Which brings us on to the subject of organics, though some of you might not like my approach! How about getting on your keyboard and putting me straight. Way back in the early ’80s, (so I no longer have the original measurements) I did an experiment on my walnut (J. regia) nursery, where one block got pig poo, one block got mineral fertilizer, and one got both. The pig poo one grew about 25 cm, the mineral fertilizer one grew about 35 cm, and the block that got both grew about 1 metre. Customers who put blood and bone under their walnut trees at planting occasionally reported losing them from phytophthora. I buried a horse beside a couple of trees once and they loved it. I have since buried pig guts etc from butchering an animal beside walnut trees 2 or 3 times and have lost one from phytophthora. My conclusion from all of this is; don’t bury animal matter too close to a walnut tree. Fertilize walnut trees on the surface of the soil with anything you can get your hands on, and just because you use compost and manure does not mean you use less mineral fertilizer. People contemplating spraying for blight this spring should check out the very useful information on the Walnut Industry Group webpage. The Diamond Foods webpage is also good. Both links below. Well, I am frankly struggling with the technology. Thank you Jilleen Anderson and John Allen for your encouragement to set up a better blog experience. You are right, my emails are not able to do justice to the great replies I received. Therefore I have been trying to set up a Facebook page that everyone can look at, without you having to wade through the stuff friends and relatives keep posting on the site. They cannot understand that I am only interested in walnuts, (apart from one major exception.) Screening them out looks like it is preventing you from posting comments. Have a look. You don’t need to apply to be ‘my friend’ to look at the walnut photos. See what you can get out of it, but you may have to email me your comments for me to post up there. If you search on ‘walnuts’, you will find the Walnut Action Group site that I have created on Facebook as well. I think this will let you post comments, but you will have to become a member of that site first. Maybe my personal site will make more sense because the Group site does not separate out topics and throws everything together in a big jumble. I admit that this set up falls short of Jilleen’s idea of, ”you would just need to send out an e-mail letting us know when your next blog post was up. We could not only comment, but also read everyone else’s comments.” Hopefully we can have a better system next time. Yours, struggling with the technology.